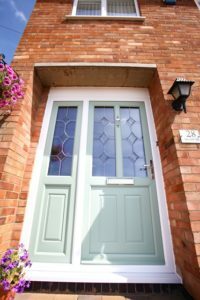 A Hinckley fabricator has become the first company to offer its customers the entire Liniar range –firmly believing that the quality and variety of products has contributed to the soaring success that they’ve enjoyed over the last seven years. 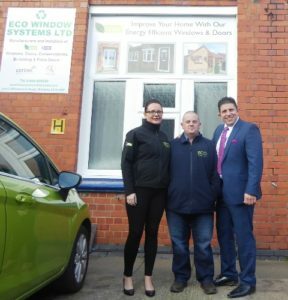 Eco Window Systems was launched by Tim Moore in 2010 and has manufactured Liniar windows right from the very beginning, eagerly adding each new product to its own portfolio as soon as it was released to the market. “I chose Liniar from start up mainly because of word of mouth,” explains Tim. “The people I spoke to told me that Liniar was the best. The quality was obvious and it was much faster to fabricate because of the lack of steel. “It was the best decision I’ve ever made! Since then we’ve embraced every new product that Liniar have launched and our customers love them. We have complete faith that everything new that’s launched has been fully tested and of the highest standard. 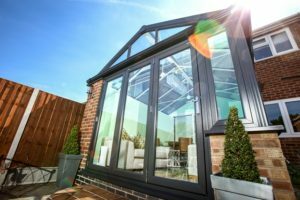 Liniar’s ModLok™ bi-fold and patio doors, conservatory roofs, trims and installation supplies and, more recently, roofline products and Alumina doors, all allow Eco to offer its customers the full comprehensive range. “I always say that if it’s not on the shelf then you can’t sell it,” says Tim. “We’re always looking to offer our customers something extra and provide other avenues to meet their needs. We only use Liniar’s six chambered EnergyPlus profile in our windows for the maximum thermal efficiency. “We don’t sell on price but instead pride ourselves on the exceptional quality of what we manufacture. The Liniar products are second to none and when you combine that with the level of care and pride that we take in our work here, the result is outstanding. “Installers love us because we’re a one-stop shop for all things Liniar. They can come to us and get everything they need in one trip rather than losing precious time buying different items from several suppliers. Gemma Harrison, who joined Eco in 2012 as a processor before being made a Director two years later, takes up the story. “A big part of our success is down to the loyalty and support we’ve received from Liniar over the last seven years – particularly from Tony Basile, our sales representative. He’s always been at the end of the phone if we’ve needed help with anything. That inspiration has helped Eco to grow far beyond its humble beginnings. Starting with a workforce of two producing approximately 20 frames a week, Eco has since doubled the size of its factory and now has a team of 8 manufacturing 80-90 frames on average. Adding the Liniar roofline products to its range has led to even further expansion for Eco. A new van has been added to the fleet, capable of delivering 5.5m lengths, and three storage units have been acquired to house the soffits, fascias, trims, guttering etc outside of the factory. “The units are ideal to store the roofline products,” says Tim. “But the way things have been going we’ll almost certainly be looking for new, larger premises in the very near future to enable us to cope with demand. And one of those regulars, Phil Jeffery of PJ Windows, was quick to point out another reason that Eco has been so successful. Tony Basile, now Business Development Director at Liniar, describes Eco as a “shining example” of how successful a fabricator can be when working closely with its system house. “We took Eco on as a customer right from the beginning and it’s fantastic to see how much the company has grown in that time,” says Tony. “They were one of the first to become a Liniar Approved Fabricator in 2014 and have continued to expand since. “They haven’t allowed themselves to become complacent – instead they’re always looking for new ideas, suggestions or products coming to market to enable them to pass on the benefits to their customers. 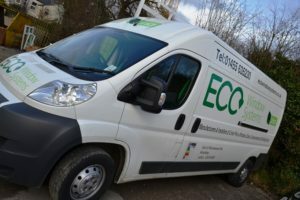 “I’ve even taken other potential clients on visits to Eco to show them the advantages of fabricating and supplying our products as they really are the epitome of a Liniar customer! 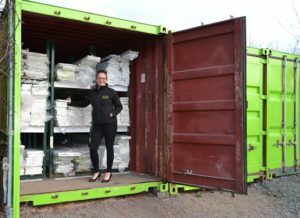 “It’s no surprise that they are the first to offer the full range of Liniar products – they’ve even sold some of our decking after displaying some at their show site at Twycross. Click here to find out more about Eco Window Systems or call 01455 635230, or for more information on Liniar click here.